by Kathleen Quillian with contributions from Timeless Motion artists’: Antonella Bonfanti, Paul Clipson, Keith Evans, Kerry Laitala, Jeanne Liotta, Scott Stark and Mark Wilson. Retrospectroscope (1996) by Kerry Laitala, plexiglass disc with silver gelatin transparencies on rotating motor, 5’ diameter disk x 4′ height. Artists in the Timeless Motion exhibition were selected in part because of a shared tendency to make work in other mediums that both stem from and feed into their investigations of the moving image. The exhibition has been conceived as a way to bring work by these artists together in order to offer a new perspective on image making and to begin a dialogue that is somehow lacking between moving image artists and the fine art or “gallery-going” community. Thus, some of the work is laid out as sequential imagery, some is projected, some is sculptural. In all cases, the exhibition gives form to the otherwise ephemeral moving image and puts it into a physical space to be experienced at the pace of the viewer. In this way, viewers have the opportunity to both study the mechanics behind and appreciate the poetry of the medium. The exhibition as a whole creates a miniature constellation of study into the nature of the moving image. As viewers become more engaged with the exhibition they will find that materials and themes begin to resonate between the different projects, inviting connections, striking chords and sparking further questions. Paul Clipson’s installation Funera et Serpentium (2015) explores the abstract and formal capabilities of the anamorphic photographic process via superimposition and the layering of sound and image. As the content of the film explores this photographic technique, another story will be playing out on the material of the film itself. Running as a continuous film loop for the duration of the exhibition, the print will undoubtedly rack up some wear and tear, highlighting the tangibility and fragility of the medium as scratches in the celluloid slowly begin to build up over time. These scratches, while distorting and obscuring the image, will also inscribe onto itself a record of its existence in the gallery as dust and whatever else finds its way into the atmosphere moves through the mechanism of the projector and makes its mark on the surface of the film. Another installation that involves the widescreen image in its investigation is Keith Evans’ Lenticle to the Sun (2016) which stages “a surrealist radio drama of star-charts, stray dogs and shipbuilders” in homage to Saint Francis through elements placed in peculiar and otherwise overlooked spaces in the gallery. The observer is a necessary component of this installation as s/he hovers on glass over a pre-existing hole in the gallery floor to look through a telescope at the details of a moving panorama box placed 25′ high up on the wall at the opposite end of the gallery. The bodily existence of the viewer triggers radio waves and light projections, essentially informing what they see and hear. Diagram Squared, 2013, archival inkjet prints, 16mm film transferred to digital video loop. In correlation to Evans’ playful take on scientific observations, Jeanne Liotta’s Diagram Squared (2013) is made up of two 16mm scientific animations from the 1970s projected onto two original digital prints from the artist’s “Spontaneous Geometry” series. The resulting combination provides an enhanced spatial and temporal experience for viewers as they consider the images’ individual and collective attempts to illustrate, through diagrams, our relative experience of simultaneous time. The initial intention of the diagrams to provide a concrete visualization of abstract, invisible or seemingly unknowable concepts eventually collapses into a humorous defeat when the realization strikes that no matter how many layers of explanations we attempt to take in, we can never really understand how time in fact works. Also weaving whimsy through scientific phenomena, Kerry Laitala’s Retrospectroscope (1996) and its new companion piece the Cosmoscope (2016) are kinetic sculptures inspired and informed by nineteenth century proto-cinematic devices that simulate motion through the unfolding of sequential images. These larger-than-life contraptions allow the viewer to experience the cyclical aspects of time as well as the perceptual illusion of motion as the wheels rotate and the images blend into a series of singular movements. With the sculptures she has re-shaped the cinematic experience into something akin to a cubist painting in which all aspects are represented simultaneously. Viewers can watch a particular series unfold or allow themselves to get lost in the various associations that develop between the consecutive rings of imagery as they endlessly rotate through space and time together. Along with the sculptures, Laitala is also exhibiting several large scale photographs from her recent cosmo-electro-photographic series. These photographs are made by placing electrically charged objects on large format film which is then exposed by the coronal discharge of the objects leaving shadow graphic traces on the film surface. This series continues her investigations into camera-less image making, driven by her well-informed understanding of history and technique and inspired by her interests in the charged nexus where science meets superstition and belief meets manifestation. Expanded View (detail), 2016, photo collage and looped animations. Another installation that re-configures the moving image into sequential stills is my own Expanded View (2016), a series of photo collaged images and the animations from which they came playing as a video loop on a monitor. Each collage sequence illustrates a simple act or series of acts that, in the animation, would last only a few seconds. Laid out as linear sequential panoramas they illustrate just how many individual frames of imagery make up one movement or gesture. In the physical space of the gallery these images are measured in terms of space rather than time. The sequences are reminiscent of “exploded view” diagrams that show the relationship or assembly order of all the parts of an object all at once. A viewer has the option to experience the work at both the macro and the micro levels depending on his or her level of engagement, taking in details of individual images or looking at the overall trajectory of action. 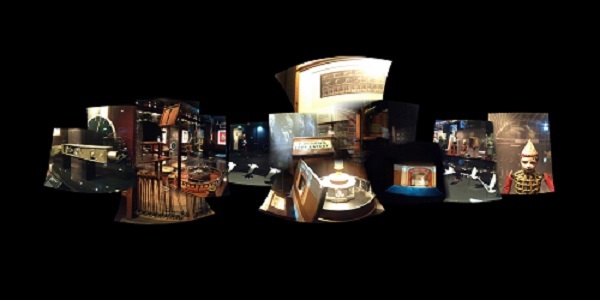 The collage panoramas and the video animations together illustrate the different ways a viewer can experience the same imagery and how our perception changes in relationship to the time we take and the spaces we occupy to view them. Continuing the theme of exploring cinema through sequential still imagery is the work of Mark Wilson who uses drawing, photography and printmaking to experiment with the display of multiple images as fragments of a unified work. 88keys (2008) is a series of pictographic drawings displayed together as a storyboard, suggesting a linear progression, but also offering the viewer a chance to read all the images at once in a nonlinear, omniscient, holistic way. Phenakistoscopes (2009, a series of 10 prints) and Ghost Dance (2009, an animated video made from those prints) are similarly made up of pictographic sequential images. In the prints, the images are displayed together in a circle or disc, static and fragmented, much like the early optical toy from which the series takes its name. 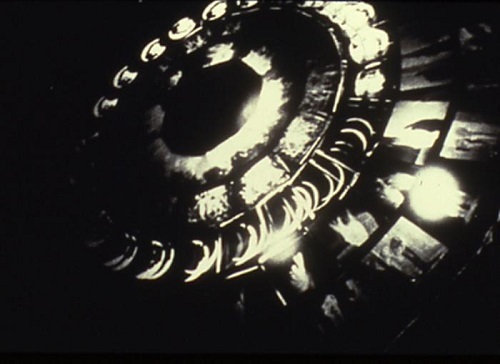 In the animation, the images are shown in action, moving in a circle, appearing to be unified in the performance of a ritual dance. Interestingly, each disc of animated drawings completes a full revolution every second, effectively functioning as a timepiece. Cylindric Impressions (2015) is a series of images made using a smartphone and panorama app. that considers sequential imagery from a different perspective. Compositions are made from a series of individual images that are merged together into a singular unified whole that, in some cases, were created over the course of several minutes. The passage of time and the camera’s movement through space are recorded and conveyed within the final composition. The relationship of time to the act of image-making is spelled out in similar but very different ways in both series. Cylindric Impression: Le Musée de la Cinémathèque française, No. 10 (2015) by Mark Wilson, archival pigment print, 32″ x 16″. And finally,Scott Stark’s Low-Res Arborscope (2016) is a vibrant, dynamic, para-cinematic installation that questions our relationship to the physical world in a heavily mediated society. At the center of this large-scale installation is a large pile of tree branches and other natural materials. 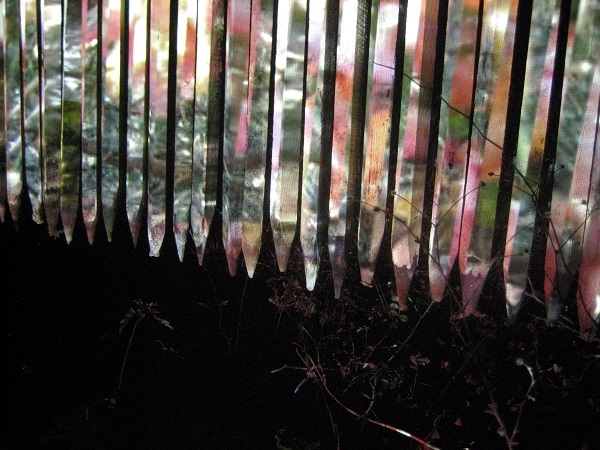 Video of movement through a forest is projected onto the natural materials through a human-created “screen” made of manufactured, wooden stakes. The rough-hewn stakes crudely intercept the projected video, casting ominous, scintillating shadows onto the natural elements. Using a low-resolution “screen” of two dozen wooden stakes, Low-Res Arborscope contradicts contemporary urgencies about the superior quality of “high-definition,” “maximum dpi” and ever-increasing “megapixels” in a highly mediated culture. Each wooden stake mimics a television scan line, such that its “resolution” is extremely low and rudimentary, as if it were a movie screen designed in the prehistoric past. As light is cast upon this low-res rendition of a movie screen, glittering, shadowy images appear in the dense tangle of natural ephemera behind it, suggesting a kind of pre-cinematic experience that confounds and reconfigures mediated and sensory expectations. Light dances along the tips of tree branches, grasses and brush, and the shadows suggest negative spaces, absences or segmentations of their physical trajectories, inviting a para-cinematic sense of wonder. Lo-Res Arborscape (2015) by Scott Stark, digital video, tree branches and wooden slats, 25′ x 14’. In addition to the artists in the gallery exhibition, Timeless Motion also includes expanded cinema performances by Robert Fox, Beige (Vanessa O’Neill & Kent Long), Greta Snider, and Bryan Boyce & Adrianne Finelli with Jackie Jones. These artists were invited to submit proposals because we felt their aesthetics and concepts fit with the spirit of the show and ultimately chosen because of the rich, thematic intersections their performances would make with the works in the gallery exhibition. Jeanne Liotta also proposed to re-stage her TEA performance at the exhibition opening in collaboration with musician/sound artist Laetitia Sonami in which tea is prepared for gallery goers in the projector beam. This seemed a perfect fit with the trajectory of the exhibition and seemed a nice and welcoming way to invite the community in, so we enthusiastically agreed. Along with these performances, the gallery artists will also collaborate on a group expanded cinema performance for a special show at Shapeshifters Cinema in Oakland where we will have a chance to present ourselves in our elemental state of working (live) with the moving image. We began planning the exhibition around the end of 2014 and met regularly throughout 2015 to organize and fine tune our ideas. The more we worked and talked and planned, the more the exhibition became a multifaceted organism that grew to include three expanded cinema programs, a panel discussion celebrating the history of underground cinema in the Bay Area, two film screenings and two workshops on cut-out animation and “cinegram” filmmaking. We felt that these additions were necessary to further engage the community in learning more about the history and practice of experimental filmmaking, an essential part of our region’s cultural history. With so many artists and so much history behind the evolution of the Bay Area film community, we by no means wanted to make this a comprehensive survey of Bay Area experimental film, rather we wanted to make it something of a starting point for community members and artists from other disciplines to learn more about the medium by showing the many different ways to approach the moving image. All of the exhibiting artists and curators have had a long collective involvement in the experimental film community. Most of us filtered through the filmmaking department at the San Francisco Art Institute at one time or another, as students or teachers, or both, and eventually found each other in the greater film community by attending local screenings, meeting together in studios and sharing works-in-progress. We also have had extensive involvement in the many organizations in the Bay Area (and elsewhere) dedicated to exhibiting and distributing experimental filmmaking either as Staff or as Board members and have worked together in various capacities, including organizing screenings, workshops and exhibitions both with and for each other. It was partly this collective experience that interested the curators at SOMArts Cultural Center in our proposed exhibition. They saw Timeless Motion as celebrating the “culture of practice” of experimental filmmaking, a genre that is little understood or appreciated outside of (and sometimes even inside) the filmmaking community. We have shaped this exhibition to connect the “black box” of the theatre to the “white box” of the gallery with work that explores the fundamental nature of the moving image. We hope that our efforts will both help to attract new audiences to the moving-image arts as well as encourage dialogues between filmmakers and other kindred spirits. For more on Timeless Motion artists, please see our Contributors‘ page.